The unilevel was the first plan to challenge the dominance of the breakaway. It came on the scene in the mid 90s, and its inventors intended it to be a simpler and fairer plan that was easier to understand. Over the years, unilevels have come to be just as complex as breakaways. The backbone of a unilevel plan is the level commission it gets its name from. Distributors earn a percentage on personal volume generated in a specific number of levels of their downlines. In most unilevels, as you climb the ranks, you qualify to earn commissions on more levels. In the early days of the unilevel, that one commission was the entire compensation plan. Companies that added other commissions were called hybrid unilevels, but over time as virtually all unilevels added additional commissions, the term hybrid unilevel fell out of use. Most of the MLM commission plans that we call unilevels today are actually hybrid unilevels. In a unilevel plan, everyone a distributor enrolls is on their first level. There is no limit to how many people a distributor can recruit onto her first level. If Karen keeps personally enrolling, her first level will keep growing. Her earnings increase as her organization grows in both width and depth. But there is a limit to the depth she can be earn commissions on. The unilevel commission pays distributors a percentage on the personal volume of their recruits (and their recruits and so on) typically going down five to nine levels. 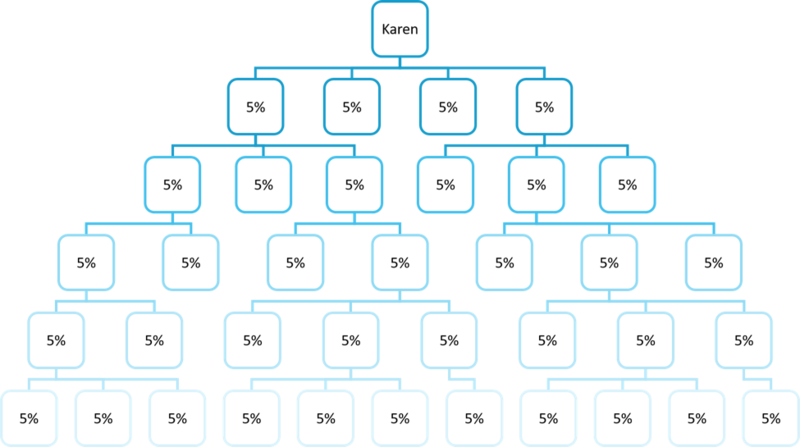 In this illustration, Karen is a distributor earning 5% on five levels of downline distributors. If everyone in this tree is generating $100 of personal volume, Karen is earning a $180 commission check. Most of the people in this tree are people Karen didn’t personally recruit. Toward the bottom of the tree, she may have put no direct effort in at all to generate the volume. It should be easy for you to see why you need to supplement the standard unilevel (if you choose to use one) with other commissions—your distributors are paid equally for volume they were actively involved in generating and for volume they weren’t. Let’s say Karen’s just getting started and she only has those first four recruits. Karen put in all the work to recruit these four people and each of them has purchased $100 worth of product as a direct result of her sales efforts, but she’s only getting $20. She might’ve done ten hours of work for that $20. If one of Karen’s recruits is a natural salesperson and he starts recruiting on his own, without much help from Karen, she’s going to get exactly the same commission on his work as she got on her own work. 5% is a reasonable commission if she didn’t personally put in the time to make the sale, but it’s simply not enough if she did. Most unilevel companies add other commissions like fast starts and/or pool bonuses to increase earnings for specific segments of the organization—such as active salespeople and top-level sales leaders. “Mini-barrier” plans that have everyone sign up as preferred consumers and then automatically advance to a distributor status when they qualify. A small differential or single-level commission on the front of the plan. Level commission percentages, which change as a distributor’s rank changes. Pool commissions for the top ranks. Infinity commissions for the top ranks. Conversion from a level commission paid on personal volume to a level commission paid on group volume. This can make a tremendous difference in earnings. Dynamic compression. A mechanism for bypassing unqualified or inactive distributors when determining payout so that the upline is paid on the number of active levels. Only active distributors count as levels in the commission plan. When you’re adding supplemental bonuses to your unilevel commission plan, you must make sure to note how the different types of commissions in your mix interact. You might find some conflicts or opposing forces at play. Eliminate them quickly! Many modern unilevel compensation plans have a fast start commission, because fast starts reward the new distributor or the active salesperson who just wants to sell product and isn’t interested in building a downline. Without a good fast start program, a unilevel plan will stay close to the 5% earnings line. A fast start could bump earnings up to 7–12% for the people who are actively increasing your sales. One of the issues unilevels struggle with is stacking. Stacking is a distributor behavior that’s meant to beat the compensation plan by collecting commissions on the same downline customer multiple times. Let’s go back to Karen. She’s just starting out and she has several people interested in the company. As the recruiting distributor, she should place all of them on her first level and she should get the unilevel commission on their volume. If everyone in this tree buys $100 worth of product, Karen gets a $20 commission. 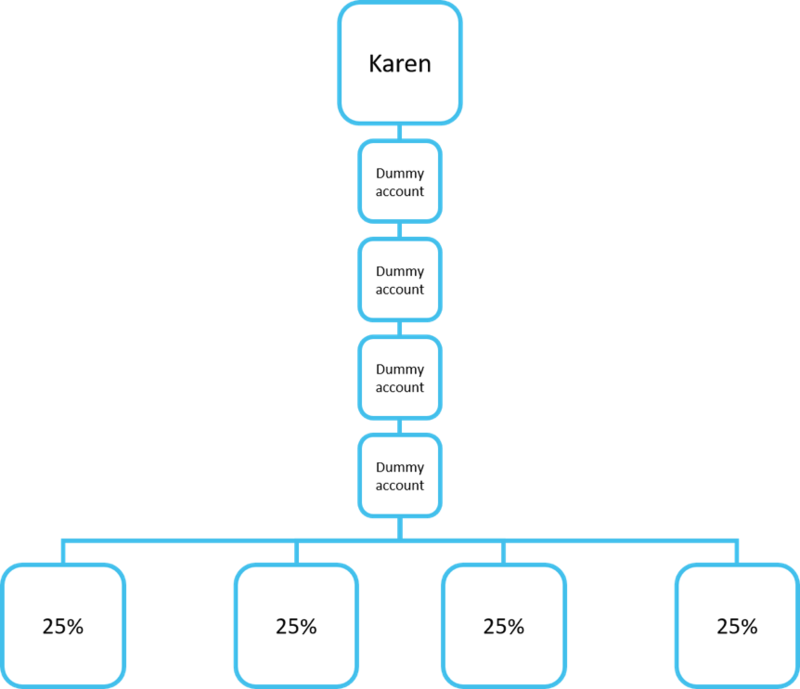 Now Karen gets her 5% and each dummy account gets 5% too—she’s receiving the 5% commission five times. If each of her recruits buys $100 worth of product, Karen gets $100 in commissions. The point of the level commission is to reward the upline for building the organization. Stacking defeats this objective. The distributors above Karen get no commissions on her downline and have no incentive to collaborate and work with the people beneath her and Karen has no incentive to work with the people beyond her lowest paying level. She has an incentive to work only with her personal recruits. Her behavior has cut off everyone beneath her payline from any kind of upline support. If everyone stacked, no one would receive any downline commissions. If stacking becomes rampant, the net effect is the same as simply paying a one level commission with no downline commission. This is an important problem for your company to address if you have a unilevel compensation plan. You can read about how to do that here. Unilevels are infinitely flexible. They give you a lot of control over the behaviors you reward and how you reward them. Because of the many variations on the unilevel, a company can create a truly unique commission plan for itself. Distributors may expect one result and have something totally different occur. This often requires a company to spend more time training distributors on the commission plan. 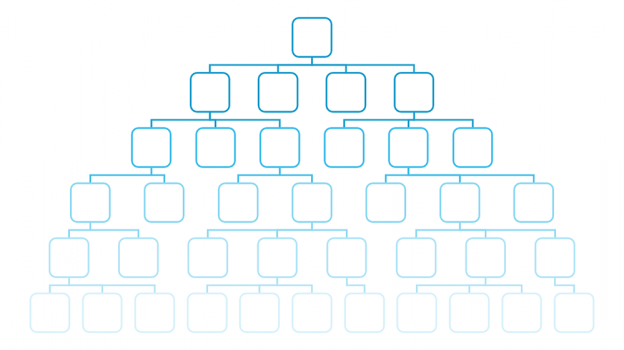 People expect this type plan to be simple and easy, yet many are complex and difficult. This can create distributor frustration. If you’re thinking about starting an MLM company using this type of commission plan, spend the time and energy to create realistic data models with a lot of variations of the plan. Do dozens of test commission runs before you decide on a final commission plan so you know exactly what you have when you’re finished. This will enable you to confidently tell your distributors how the plan is going to pay. Thanks for this very informational article, looking forward to many more.